From what I’ve been able to gather from these cannibal movies, the actual presence of primitive tribes practicing cannibalism in today’s world is pretty limited. So how is it then that if these vicious cannibals are invariably “the last of their kind” a “lost tribe” or “thought long extinct” that every stupid group of documentary filmmakers, reporters, fashion models, and businessmen manage to either crash land smack dab in the middle of their territory, or worse yet, mount an expedition that takes them straight into their stew pots? As expected from an Italian cannibal flick, Ruggero Deodato’s (Dial: Help) Jungle Holocaust offers up plenty of grim death, torture, and animal abuse, but is also surprisingly involving since Deodato approaches the story of businessman Robert Harper as one of survival and how Harper does whatever it takes to stay alive, ultimately committing the very acts that he once believed separated modern man from the primitives. Things start off inauspiciously enough with Robert and three other people on a small plane flying into the jungle to check out some business concern he’s trying to get up and running there. No one on the ground answers their radio calls and the landing strip hasn’t been mowed in a few weeks which causes the plane to lose a wheel on landing. Robert isn’t too thrilled with his workers and upon checking the camp finds it deserted. A search of the area shows evidence that his crew may have met their fate at the hands of a tribe of cannibals, so Robert and his three companions go back to the plane, the wheel having been fixed and decide to fly out in the morning when it’s light out. The next day, the pilot ends up impaled on one of those falling spike balls the cannibals always have tied in the trees for intruders and Robert and his remaining friend Rolf (Ivan Rassimov from Spasmo) decide they need to get back to the plane and get out of there before they’re next. Their problem though is that the cannibals have chased them around so that they’re lost and they end up building a raft to get them down the river that they think flowed passed the airfield. Robert and Rolf are ultimately separated when they go over some pretty nasty rapids and Robert ends up a prisoner of the cannibal tribe while Rolf has completely disappeared. The middle part of the movie where Robert is held captive by the tribe at once hews closely to the conventions of these sorts of movies, but also manages to go beyond the expected scenes of carnage. You are treated to various scenes of animals being slaughtered and some gore, but it’s not omnipresent or done purely to shock so much as to illustrate what Robert was going through and what caused him to descend into savagery by the end of the film. Some of the movie’s best stomach churning moments have nothing to do with the gore as both us and Robert wonder why they haven’t simply killed and eaten him. He figures out that because he came in on the airplane, they think he’s like a bird and can fly. This results in some queasy scenes where they hoist him up to the top of the enormous cave they inhabit and then let him drop free-fall style until he almost crashes on the ground. Who knew that the bungee jump was invented by a lost tribe of jungle cannibals? He survives that and is thrown in a cage with some birds and realizes that he will soon be used for gator bait. This is when he decides that it’s time to get primitive on these jokers and grabs a good sturdy rock and pulls the old possum trick before brutally making his escape. Robert’s ultimate act of becoming those that he has struggled against takes place shortly before he gets back to the plane. Once aboard the plane Robert pleads with the barely alive Rolf to tell him that Rolf would’ve have done the same thing if it were him. A surprisingly gripping account that mostly fulfills the icky promise these cannibal movies usually fail so dismally at. 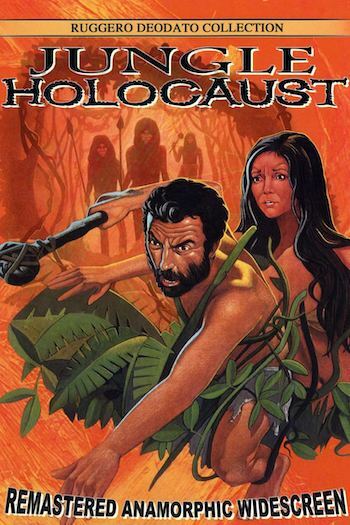 Of the high profile Italian jungle movies including Cannibal Holocaust, Cannibal Ferox, and Eaten Alive, Jungle Holocaust is far and away the best of the lot. Massimo Foschi lets all hang out (literally) and impresses with a performance that gets across Robert’s changing character with very little dialogue and wide-eyed looks that go from shock, to haunted, to numbed. The decision to concentrate on a single man, his fears and uncertainty as to his fate, the things he has to endure, and the acts he has to commit in an effort to stay alive transforms what could have been simply another crummy collection of special effects shots and animal slaughter footage, into something shocking – a story that horrifies you, but doesn’t gross you out.